Britain's constitution is being re-written in Daily Mail and Telegraph headlines to keep Labour out; and Labour's Jim Murphy is helping them. Anyone could be forgiven for thinking that Westminster has been replaced with a bouncy castle, and our political class with hysterical children. As the long anticipated rise of the SNP looms closer into sight, the Conservative press seems to have wet itself in fear. 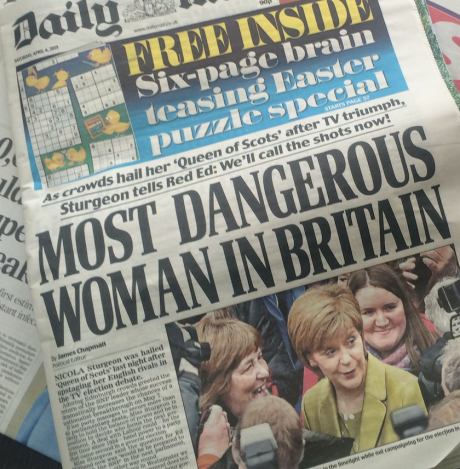 The Daily Mail front page on Saturday shrieked that Nicola Sturgeon is “The most dangerous woman in Britain”. The Times’ front page story declared that Labour is panicking and likely to run to the left after the SNP leaders' debate victory. The Telegraph gave up on any remaining pretence of journalistic standards, and ran a story about a conversation between the First Minister and the French Ambassador without asking either of them for a quote on it (if they had, they’d have found that both deny it). It’s worth considering for a moment why this is. Conventional wisdom in the Labour party is that a strong SNP is good for the Tories. Why, then, would the Tory press be so quick to attack them? Particularly in a way, as with the Telegraph, which might actually have damaged them, had the punch landed? For me, the most obvious answer to this question is that the papers are not just preparing for the 7th of May, but also for the following week. Many if not most polls recently have, when translated through Britain’s absurd election system, shown roughly the same result: the Tories will have slightly more votes and seats than Labour, but Labour plus the SNP will have more than the Tories plus the Lib Dems; or, to go into more detail, Labour + SNP + Plaid Cymru + SDLP + Green + Lady Sylvia Hermon have more seats than Tory + Lib Dem + DUP + UKIP (+ maybe Alliance + UUP). If this is the result, then what will happen next? Without a written constitution, there is a surprising extent to which that’s up for grabs. 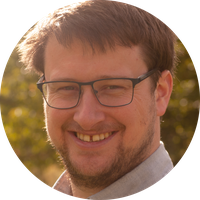 In a move slammed in an email to openDemocracy from Graham Allen, chair of the Constitutional Reform Select Committee, as 'an affront to the electors', David Cameron has postponed the return of Parliament until the 18th of May. This leaves even more time for a right royal stitch up, with grappling between leaders over a request from the Queen to form a government. Without a proper constitution, and without Westminster meeting for 11 days, it’s not just the parliamentary maths that matters, though it does. There will also be, in the immediate hours after the election, an important question around the ‘mood of the nation’. And that will be defined, at least to some extent, by the front pages of the newspapers. It seems they are going to do this in two ways. The first is that they get to set the goalposts and define what it means to ‘win’. The second is what’s on display at the moment across the press — an attempt to delegitimise any partnership between Labour and the SNP. When the former debate comes up, I like to ask people a question. Who won the 1955 General Election in the UK? The answer is obvious: the Tories, led by Anthony Eden. But in the current context, it’s worth noting a peculiarity. The MPs who elected Eden in fact ran with a number of different names on their ballot papers and, in a sense, came from a number of different parties. These included the Ulster Unionists in Northern Ireland, the Unionists in Scotland, and groupings called the National Liberals and Liberal Nationals who were a split from the Liberal Party who had a pact with the Tories. In fact, in 1955, the single party which got the most seats — 277 to the Conservatives' 274 — was Labour. But that certainly doesn’t mean they had any right to govern. Most MPs were elected being clear that they would vote for Eden as Prime Minister. That’s what they did. Although the SNP aren’t to Labour as the Scottish Unionists were to the Conservatives, I think this analogy is important because it reveals the democratic mechanism in play. If someone votes for an SNP MP in this election, or a Green MP, or a Plaid Cymru MP, then they can reasonably expect that that MP is going to vote to sack David Cameron and replace him with Ed Miliband — because that’s what they have said they are likely to do. If that is true for the majority of MPs, then the democratic outcome is for Ed Miliband to be Prime Minister, even if Labour on its own has a slightly smaller parliamentary group than the Tories. The precedent for who gets to govern if Parliament is hung is complex, as outlined here, but ultimately boils down to who can pass budgets and win votes of confidence, which has nothing intrinsically to do with being the biggest single party. However, this is not how the Tory press will interpret the election. If they can possibly get away with it, they will find any way they can to declare Cameron the winner, even if it’s going to be almost impossible for him to command a parliamentary majority. In doing so, they will seek to make it impossible for Miliband to govern. This circumstance would in effect be a coup by newspaper proprietors against the people of the country. Because our constitution is written not in statute, but headlines, this is perfectly possible. It's important to read this story in the Daily Mail today in that context. By saying that the SNP have vowed to "prop up Ed Miliband in Downing Street — even if he loses the election", they have redefined what it is to win an election in a parliamentary system — changing the goalposts from a functioning majority to biggest single party. In reality, if Labour and the parties to their left have a parliamentary majority, then no Tory government can survive long. But it doesn’t need to. If Cameron can stay even briefly as PM, then he can call a second election and use his party’s superior wealth to secure a better position against a Labour party already financially crippled by this vote. In this context, Labour should be doing everything they can to ensure the goalposts stay where they are — who can command a parliamentary majority — and are not shifted to which one party is the biggest. Unfortunately for Ed Miliband, Jim Murphy and other Scottish Labour MPs are selfish enough to be more concerned about saving their own seats than they are about getting Cameron out of Downing Street. Because of this, they have repeatedly been saying, sometimes repeated by the UK party, that the biggest party gets to be the government. If we do end up with the circumstance outlined above — as seems reasonably likely, we can assume that these comments will be pulled from the shelf and repeated at Labour on loop. To put it bluntly, Murphy is making a Tory government more likely. This has been pointed out to him repeatedly. He seems not to care. The second attempt to keep Miliband out on the 8th of May has been more explicit. Attacks on the SNP from both the Tories and the Tory press are of such a tone that they are likely to persuade more Scottish voters than ever to support independence, and so threaten the very union that these people claim they wish to keep together. In part, these attacks are about winning votes from Labour on the election day — “you can’t vote for them, because the SNP will be calling the moves”. But they are also designed to make the Labour bigwigs fear the long term implications of relying on the SNP, and to encourage them to put pressure on Miliband not to form a government just as they pulled the plug on Brown’s attempted negotiations. In this context, the debates were telling. For anyone who believes the Telegraph’s unchecked smear that Sturgeon wants a Conservative government, it’s worth thinking about a simple question. Why did she spend most of the time in the debate reaching out to voters in England, Wales and Northern Ireland? This does almost nothing to boost the vote for her party. In fact, the attacks on the SNP only push Scotland further from Westminster and make a future yes vote more likely. The obvious explanation is that she was softening the ground for a post election loose pact between Labour and the SNP (and possibly also the Green Party, who she has said she would likely vote for in England, and Plaid Cymru and the SDLP). The Labour party needs to learn something from this. Whilst in Scotland, it is only reasonable that they fight hard for every vote, Miliband needs to start softening the English up to his most likely route to Downing Street — an arrangement with Sturgeon. To an extent, he did this in the debate — saving his attacks for the Tories rather than turning on the SNP. But with Scottish Labour screaming at him through the Times front page, begging him to kick Sturgeon harder in the challengers’ debate, it’s vital to his own future that he ignores those threats, and allows the First Minister to do his work for him by reminding English voters not to believe the hysterical screams from the Tory press. It’s likely that this election is as much about the 8th of May as the seventh. The Conservative press are lining up to push Cameron into Downing Street even if most of the UK has just voted to sack him. Labour need to fight back against this. Unfortunately, they seem too distracted by the ground in front of them to look up. Note: A few people have argued that the above is negated by the Fixed Term Parliament Act of 2011. It isn't. The Act states that an election shall take place if "if a motion of no confidence is passed and no alternative government is confirmed by the Commons within 14 days". The scenario I am outlining requires Labour to refuse to do a deal with the SNP because of perceptions of long term political damage, and so refusing to form a government within the required 14 days, because they feel, in effect, that it is politically impossible to do so.